We face the wrong way to get stunning sunsets over the waves, but I'm often out at the tennis club in the (relative) cool of the evening around dusk. It's the best time of the day to knock a few balls around, after the heat of the afternoon has passed. Now in truth I'm not a brilliant tennis player, and it takes very little to distract me from those clay courts. The club is set in rolling farmland. 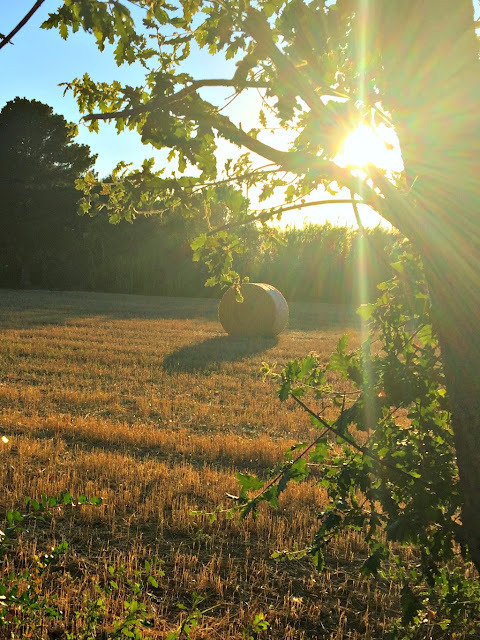 And at this time of the year, with the cereal crops harvested and the great round bales of straw waiting to be collected, it turns into the most glorious golden landscape. Just at the point at which the sun is dipping below the brows of the surrounding hills and the shadows are lengthening it's at its very best. So there you are, that's my excuse for ducking out of play.